A little girl who sang at the opening ceremony of the Beijing Olympics was miming to a song recorded by a less "pretty" girl. Lin Miaoke charmed the world with a rendition of "Ode to the Motherland". But the real singer was Yang Peiyi. The show's musical director said Lin was used because it was in the best interests of the country. BBC News website readers have been sending us their opinions on whether this has damaged the image of the Beijing Olympic games. Below are a selection of your comments. China's opening ceremony for the 2008 Olympics was absolutely spectacular. The news that Yang Peiyi may have been denied a chance to be recognised on TV for her tremendous talent and beauty, however, is heartbreaking. I believe that China has hurt its image rather than preserved it. I believe these kinds of ceremonies are all about theatrics and good planning. The grandeur and emotion it caused, along with the good impressions about China as a host for the Olympics remain untainted. I watched the ceremony live on NBC in America and the announcer mentioned that the fireworks display was not live. I don't see what the big deal is. Kind of weird that they went "Milli Vanilli" on us with the little girl but she was really cute. There is nothing wrong with pre-recorded segments and nothing wrong with miming either. London will be holding the Olympics in four years, I sense a kind of jealousy here. I'm Chinese and think it's a bit of a disappointment that they had to fake things. I especially feel sorry for the girl who sang the song but didn't feature. But on the other hand, as a Chinese living in the UK, the ceremony surely made us proud. I nearly cried when that girl sang. Unfortunately it shows the hypocritical side of China. How do we trust a country that consistently lies? This was their chance and they blew it in front of the whole world. Oh no! You'll be telling me next that some of the performers didn't actually fly but were on wires. You may guess that it hasn't affected my views on a simply terrific opening ceremony. "The best interest of the country"? I feel that I cannot trust this country. I'd have enjoyed the show more with everything live and real. This is a shame for all the other performers and artists who worked so hard. The real girl with the voice of an angel should have been allowed to front the ceremony. There was nothing wrong with her appearance. 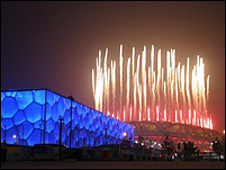 Should the opening ceremony be viewed as an "entertainment" or a "warts and all" view of Beijing? I am no lover of the Chinese government but I feel that the Chinese people deserve a little kudos and a chance to feel proud of themselves as a nation. I give them full credit for a great opening! Why is it that we rush to criticise, scrutinise and find fault in insignificant details when the opening ceremony was actually breathtaking and all performances were perfect? If anything, these two little girls worked together perfectly as a team and the result was lovely. I think that this is more of a disgrace for China. The little girl's voice is beautiful and they should be proud. What are they teaching the children of China? That they should only be proud of appearance, not of talent? So if they have a gymnast that is VERY good, but not so cute they are not allowed to perform in the Olympics? Shame on them! The phrase "putting our country's interests first" has been thrown around a lot by Chinese representatives - how exactly is that move in their best interest? The little girl Lin Miaoke looks like Audrey Hepburn, who mimed in the film "My Fair Lady". Zhang Yimou must be inspired by the film ;-) It is not easy to find out that the real singing voice of Eliza Doolittle was Marni Nixon. So the little girl was miming, so a few seats at sport events were empty. Why is this even an issue? It seems to me the British media are doing everything possible to tarnish the Beijing games for one reason only; they doubt that London 2012 can compete. I think it was very misleading and unfair to have Lin Miaoke perform over Yang Peiyi, the girl with the beautiful voice. So what if she didn't have a certain look? How sad is it that the people had to be misled all because of a pretty face? Now Lin acquires the fame and popularity that she does not deserve. I am very disappointed at the officials that allowed this and yes, it has changed my view of the Olympic ceremony. My view overall is now a negative one. Mr Chen stated, "The reason for this is that we must put our country's interest first." Should we all not be somewhat terrified of any country that considers the arbitrary beauty of its children a national interest? It's just jealousy from countries whose own opening ceremonies won't be nearly as good. They had floating globes, fireworks and thousands of dancers. What does London 2012 have planned? David Beckham kicking a football and a London bus? I think we're making too much of a fuss over this. There are "bands" which mime to other peoples voices, even during live performances. It also must take someone pretty slow to not notice that the firework scene was partly computer generated. I actually would prefer to see the computer generated footage, thinking about how much time and effort it would have taken compared to syncronising the fireworks. As a British Chinese, I can understand why they did this. Lin and Yang were both seemingly happy with their decisions to contribute to create the overall best result. I guess this is the typical Chinese culture of self-sacrifice for the greater good. In Chinese family, we are always taught to be race first, country of your root, then family and self last. Well done to Lin and Yang!! We love them all. God bless China! It's disgusting! The Olympics is not about looks, or make up, it's about the real thing - TALENT and SWEAT! Give the poor kid a break. Did you hear her voice? I was much more interested in the sound than the appearance. China is making a big mistake in thinking that we want good looks. We want talent! We can all look good if we want. If the stories are true, it is absolutely disgraceful and I am ashamed as a Chinese citizen. Having not one but two occasions of dishonest performances, it calls into question the entire opening ceremony and Olympic preparations for which so many people have worked so hard towards. It is actually not that surprising. The world is filled with fake images, fake food products even - gasp! - fake body parts. Why should the Olympics be a representation of a different world than the one we live in? I mean, it is a bit disappointing, for sure. However, in the end, this was all about entertainment, and putting on a grand show. If people were entertained, then it all served its purpose. Can you do the Bolt? Who is your local Olympic hero? How important are Olympic medals for countries?